Every two years, the International Labour Organization produces a report on labour-market trends for young people. 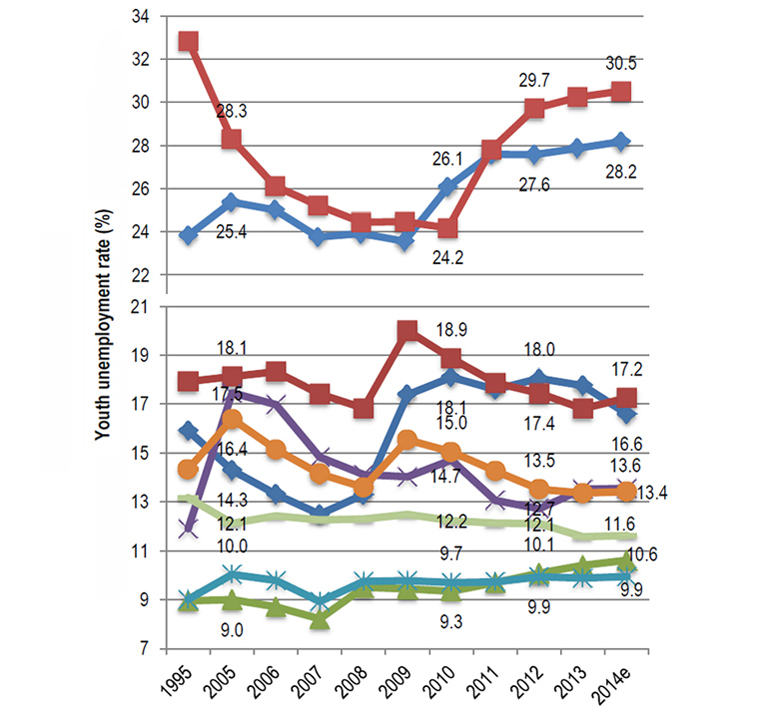 It's called the Global Employment Trends for Youth (GET Youth) and the most recent edition makes for sobering reading. It shows that the reality for far too many young women and men is that there simply aren't enough decent jobs to go around. Further, as global economic growth remains sluggish, we risk losing even the modest gains of recent years. View a larger version of this graphic here. 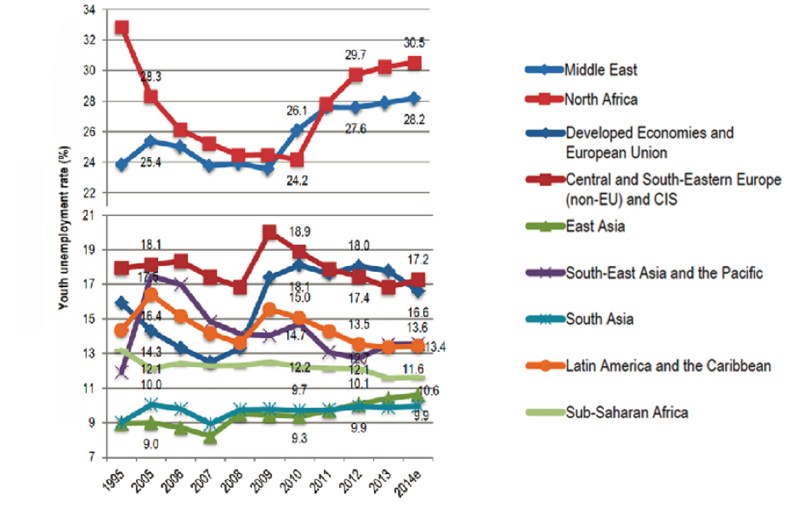 This chart shows the youth unemployment rates by region, 1995 and 2005−14. The figures speak for themselves: 73.3 million of the 200 million globally unemployed are young people (aged between 15 and 24). In two-thirds of European economies, youth unemployment remains above 20%, and more than one in three unemployed young people have been looking for work for more than a year. Work, if it comes, is often below their expectations for a quality job. The Middle East and North Africa have had rates of youth unemployment close to 30% for decades, and these remain the only regions where things have continued to worsen over recent years. Many of the young people who do have work are nevertheless living in poverty. This is especially true in developing economies. The ILO estimates that, together, the unemployed and the working poor account for two-fifths of the global youth labour force. One in three, an estimated 169 million young workers, live on less than $2 per day. If you move to $4 a day, the figure becomes 286 million. For young women, the figures are even worse. Women are less likely to participate in the workforce in the first place, and when they do they are less likely to find a job. By our estimate, 475 million jobs will be needed in the next decade to appreciably dent the number of unemployed young people and provide opportunities for the 40 million of them entering the labour market every year. So, what is the impact of youth unemployment and poor quality employment? We can think of the consequences as both personal and societal. For the individual, the evidence suggests that people who have difficulty finding their first job can jeopardize their entire employment future. The chances are that they will work in lower-skilled environments and will do it for less money for the rest of their lives. And it's not just the individual who pays the price for this lost opportunity: for the whole of society and the national and global economy, productivity is reduced and public health compromised. There is even an argument that some of the social unrest the world has seen in the last decade stems from a global younger generation who, while better educated than ever, is still not able to find meaningful and productive work. The ILO and the international community have long been acutely aware of the problem of youth employment. In 2012 our International Labour Conference adopted a Call for Action on Youth Employment as an immediate response. Many will know that the 2030 Agenda for Sustainable Development of the United Nations emphasizes youth employment directly in Goal 8. And in November 2015, the UN Chief Executives Board approved the Global Initiative on Decent Jobs for Youth, with the ILO as the lead. Assigning priority to policies for job creation. Providing jobs in the quantity and quality that we need will require action from governments. We recommend that government policies support employment and lift aggregate demand, including public employment programmes, wage and training subsidies, sectoral programmes, counter-cyclical fiscal policies and youth entrepreneurship interventions. Targeting specific disadvantages of young people through skills and labour-market policies. Several countries have adopted or expanded measures to improve the labour-market integration of young people through targeted interventions. These include labour-market training and work-experience programmes, job-search assistance and other employment services, many of which can be targeted to the most disadvantaged young people to prevent them from dropping out of work. In the European Union, for instance, the ILO is assisting countries to implement youth guarantee schemes. Promoting quality apprenticeships, informal or formal, is another solution for ensuring school-to-work transition, and a top priority for the ILO. In countries where apprenticeship systems are strong, youth-unemployment rates are no higher than those for adults. Forging partnerships for scaling up investments in decent jobs for youth. Combining the strength of international organizations, governments, employers and workers to implement global policies can really make a difference. The aforementioned new Global Initiative for Decent Jobs for Youth will pool existing expertise and enhance knowledge on what works for youth employment. It will also serve as a platform for leveraging resources from existing facilities and new ones. Clearly, responding to the challenges of global youth employment will require a tailored and multifaceted approach. However, in all cases, policy-makers must heed the voice of the younger generation. Often it is the young people concerned who understand the measures that will help them adapt in their particular situation. Young people are often the most robust advocates for those very ideas we all support: an end to child labour and forced labour, equality in the workplace, ecological sustainability and decent work. We can all benefit from that energy and sense of solidarity and social justice. In the interests of inclusive economic growth and an equitable transition to a more sustainable world, a sharper international focus on the issue of youth unemployment must be adopted. With the right will, we can develop policies to develop the skills and jobs that young people need and deserve. This post is part of a series produced by The Huffington Post and The World Economic Forum to mark the Forum's Annual Meeting 2016 (in Davos-Klosters, Switzerland, Jan. 20-23). The theme of this year's conference is "Mastering the Fourth Industrial Revolution." Read all the posts in the series here.